In Annihilation we were introduced to Area X, a mysterious stretch of coastland on America’s eastern seaboard. Cut off from the surrounding world by an invisible barrier with only one entrance, the zone is the subject of intense study. Groups of explorers are sent to chart the disturbance but few return. Those who do are not the same, suffering from memory loss, personality changes and incurable tumours. Their reports, where they exist at all, are patchy at best and edging towards hallucinatory. We join the action as the twelfth expedition begins their journey. Known only by their job titles the group enters Area X and finds themselves in a thoroughly twisted world full of abandoned dwellings, a ghostly lighthouse, strange noises and an unearthly creature, the crawler. I’ll leave the rest to your imagination. Part two, Authority, took us back outside Area X to the Southern Reach, a government agency charged with investigating the anomaly. Despite the bizarre disturbance being left behind the weirdness is ratcheted up a few notches both by the impersonal and paranoid aspect of the Southern Reach and by the thoroughly transformed biologist from the ill-fated twelfth expedition. Under interrogation by the agency and now calling herself Ghost Bird, she is a link to Area X which seems to draw its warping influence ever closer to the outside world. And so to Acceptance. Once more VanderMeer manages to pull on seemingly inexhaustible reserves of imagination and pushes the unease factor to maximum levels. We’re now caught jumping between times as we are filled in on the back story of the lighthouse keeper and the Southern Reach’s former director who, it transpires, was one of the twelfth expedition’s members. In present day we find ourselves following Control (the current director), Ghost Bird and Grace, the former director’s assistant as they make a final journey into Area X. By cutting up the narrative between five widely varying viewpoints and three distinct times we are never given a chance to settle down and recover our nerves. As the fractured narrative unfolds revelation is piled upon revelation, always threatening to throw some light on exactly what is going on, but only teasing and then shrouding everything in yet more darkness. It’s impossible to read these books out of sequence, it’s best to get that straight right away. However, when consumed as intended they add up to a transcendent literary experience. You learn to trust nothing you are being told and to expect anything. In this receptive state of mind VanderMeer has a ball restructuring your psyche and twisting your thoughts back on themselves. Each installment has its own distinct flavour and is terrifying and unnerving in an entirely different way, but they roll together utterly seamlessly. Storytelling like this doesn’t happen very often. I can only urge you in the strongest terms to get on board right now. Rewind a little… A couple of months back I reviewed Annihilation, a book which came out of nowhere and scrambled my psyche into an unrecognisable configuration. Told as a series of journal entries, a literary documentary, it followed a team of four individuals into Area X, an inexplicable patch of land on America’s coast surrounded by a force field of sorts. Entering Area X is a trial, only possible through hypnosis. Surviving there is a struggle against both the environment and your own slowly suffocating sanity. Exiting is a delayed death sentence. The hallucinatory qualities of the novel, particularly the unease created through being narrated in the first person by an increasingly unsure and unhinged biologist brought to mind the very best masters of the stranger realms of fiction. Cut to Authority. We’re once again safely outside Area X and plunged into the inner workings of Southern Reach, the government organisation responsible for monitoring the alien zone and dispatching expeditions. The biologist from the previous expedition is locked in a cell and undergoing examination after examination. Her former leader, the sinister psychologist, was none other than Southern Reach’s director travelling incognito in search of unnameable ghosts. Arriving to fill her shoes is a man naming himself, somewhat amusingly, Control. In his way stands the former director’s assistant Grace, ready to launch every obstacle she can into his path for reasons not explored until later in the story. 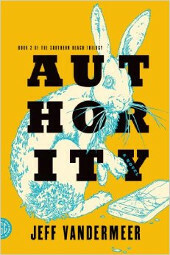 Authority starts off from a much more conventional narrative standpoint than its predecessor. Outside Area X there is at least some degree of normalcy but let’s face it, life on the border of a geographical/dimensional anomaly is never going to be what you expect. And of course the strangeness starts creeping in before you know it. Control’s bizarre insistence on his nickname and the conversations with his own controller put things off-kilter from the get-go. Then there is the former director’s office, housing surprises in every nook and cranny. Where Annihilation went for full-bore mindfuckery straight off the bat, Authority chooses to bide its time and build an ever-mounting sense of dread and insecurity. Every interaction between people is shrouded in layers of hidden meaning, no-one speaks straight and even the simplest language serves only to further confuse issues. And it’s not just about the people. It seems that the warped reality of Area X is infecting the Southern Reach itself and there is a moment towards the climax which had me checking over my shoulder and scratching non-existent itches. 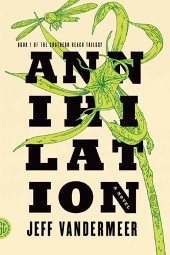 The Southern Reach of the title is a government agency dedicated to discovering the truth behind Area X, a bizarre phenomenon located on a deserted stretch of America’s coastline. Some years ago a hazy border appeared out of the blue, surrounding an apparently arbitrary area. The border has unique qualities to say the least. Nobody knows how it got there or who created it. No modern technology will work once you cross it. Communication with the outside world is impossible. If you enter at any point other than the designated doorway you will never be seen again. If you enter through the door you may return but you are unlikely to be the same person who went in. Annihilation follows the 12th Expedition into Area X. Comprised of four females, the team members do not share personal information with each other to the extent that they refer to themselves by job title rather than name. Thus we have the biologist, anthropologist, surveyor and psychologist, with the story unfolding from the biologist’s point of view. Barely armed and equipped only with basic research equipment and an unreliable map, their purpose is to find out as much as they can about what is happening within, and hopefully to come back alive. Given that the biologist’s husband died of an unknown cancer contracted during his stint in the 11th Expedition she is understandably on edge. As they venture deeper into Area X the team make more and more strange discoveries. An abandoned village adds to the sense of creeping unease and when they stumble upon a tunnel leading down into the earth their group cohesion (aided by the psychologists armoury of pre-implanted hypnotic suggestions) is stretched to the limit. What they find within defies both explanation and sanity and finally fractures the group, leaving them to figure out what they’re doing there, what the next move and how, if at all, they can get out. Annihilation is a thoroughly gripping book from the outset. Told from the pages of the biologist’s field journal it denies the reader any background information, limiting our knowledge to what she herself experiences. This lends a claustrophobic and unsettling edge to an already tense situation. Throughout the story there’s an overarching feeling of helplessness, as if events within Area X simply carry trespassers in their wake, denying them any real freedoms and channeling them towards their inevitable end. There are some rather obvious influences at play in Annihilation, from modern masters of alienation such as JG Ballard to the obvious creeping, nameless horror of HP Lovecraft. Jeff VanderMeer has obviously soaked up a lot of the works he’s been filing away in his anthologies. However this doesn’t stop Annihilation from being an utterly unique read, on which will keep you on your toes (and probably with all the lights on) until the closing pages. And even then you’ll be desperate for more. I can’t recommend this book enough. It’s well-written, original, engrossing and thoroughly strange in the best way imaginable. 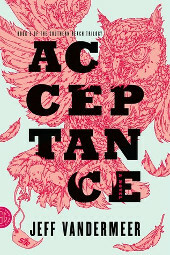 Go buy it and Authority right now and join me in waiting for the release of Acceptance in September.